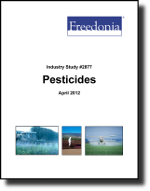 US demand for formulated pesticide products is forecast to increase 2.6 percent per year to $12.1 billion in 2016. Gains will be driven in part by rising demand for new formulations used in multiple settings. Herbicides will remain the largest product segment and show the strongest growth. The agricultural market will remain dominant and grow the fastest.